Larger inventory, over 30 new bouncers added! 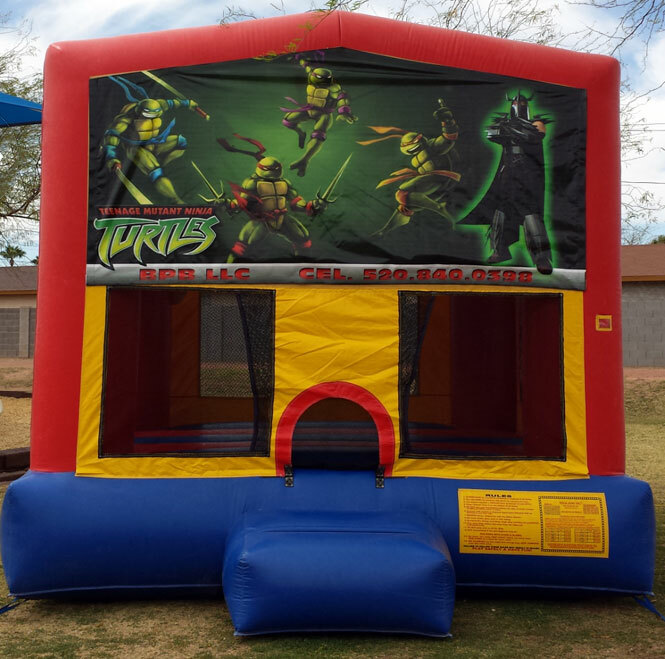 The largest selection of jumping castles, obstacle courses, water slides, combination bouncers and slides in Pinal County. Our professional staff will deliver, set up and take down a clean inflatable for your special occasion. Our rates are competitive and our inventory will provide you with the perfect entertainment for your guests. Briseño's Party Bouncers can compliment your inflatable rental with party rentals including tables and chairs, snow cone and popcorn machines, drink dispensers and party goods. If you don't see it, inquire about availability. Our large inventory is available to view online. Click on the type of rental you would like for your occasion and see what it looks like before you rent. Once you have decided on which inflatable you would like then fill out the reservation form to reserve it. Its that easy. We've heard the horror stories about how many of our competitors do not clean or repair their equipment. At Briseño's Party Bouncers, our equipment is cleaned before every rental. We have a group of employees dedicated to this task alone. With a full-time staff and friendly drivers, you can be sure we will be there. We even keep two backup drivers on call to handle emergencies. During the busy season, we've been known to rush bouncers to customers who are experiencing a "no-show" situation from a competitor. We do not require a deposit in most cases, and we will not subject you to complicated pricing structures. When we give you a price, you know it includes everything including tax. We service most areas of Pinal County including Casa Grande, Coolidge, Eloy, Toltec, Arizona City, Florence, Maricopa, Stanfield and Valley Farms.